We heard tonight from Eric Altman of OCCORD and his colleague Becky Dennison. They told us about what they did with the Grand Ave. Project in Los Angeles. They met with the developer regularly and were able to work on what is called a Community Benefits Agreement (CBA). What a CBA does is compel the developer to take the community’s needs into account when building a major development. This can include affordable housing, community services (such as a job center), hiring locals, setting aside green space, etc. Amezcua was able to attract a cross-section of local leaders to the meeting. They included two representatives of State Senator Lou Correa’s office (pictured above), Max Madrid and a former intern named Arthur Sandoval who is now a District Representative for Senator Correa. Santa Ana Parks and Recreation Commissioners Tish Leon and Julie Stroud were there too. So was Santa Ana Planning Commissioner Sean Mill and Santa Ana Housing & Redevelopment Commissioner Glen Stroud. Amin David of Los Amigos was there, along with his comrades Zeke Hernandez and Alejandro Moreno. Al Castillo was there from Chicanos Unidos, along with several of his fellow activists. I also saw past SAUSD School Board candidates Gloria Alvarado and Val Amezcua there, along with past Mayoral candidate Thomas Gordon, who also served for a time with Amezcua on the Santa Ana EPIC Commission. Former OCTA Commissioner Phil Bacerra was there too, as were a few local businesspeople, including Mike Tardif and Jacquita Deter and her son. 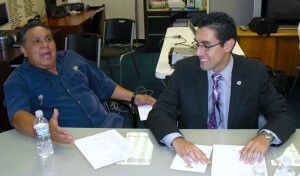 Notable Logan Barrio community representatives Joe Andrade and Sam Romero were there as well. It was great catching up with them. Romero said that he is working on a reunion of the Logan Neighborhood. Those are always festive events! Other organizations that were represented included Latino Health Access, the Santiago Lofts, the Kennedy Commission, and the SEIU. This group will be meeting again on the evening of Sep. 16, at the same location, at 7 p.m. Thanks to Al Amezcua for his leadership role in this organization and to Tish Leon for facilitating the use of the Public Law Center’s building. Kudos to Al and the others. I was impressed by the progressive nature of most of the folks in attendance. 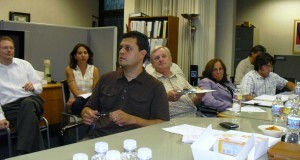 It was nice to hear folks openly discussing “affordable housing” in Santa Ana. Yes! Central planning! Race-based politicos, assorted community activists, special interests, and big labor! Cool! Viva Santa Ana! I remember the old Santa Fe train station, oh yes she was a gem. I happened to be driving by the day the bulldozer was running a muck, I rescued a door from the rubble and it’s now the door to the conference room in our office building. I despise the new fake old train station that was put in it’s place. A tip for the planners; stay away from designing fake old buildings in the “plan”, they are intended to please fools. any more meetings? or was this publicity for a mayoral run? The community coalition – Santa Ana Coalition for responsible development(SACReD) has been meeting regularly amongst it’s members, the District Plan residents ,the developer and city staff. SACReD recently submitted to city staff and the developer a document with the residents wishes regarding the type of development they want and will support. The district Plan residents will support development that will serve the needs of the residents. These needs are a Park and Community Center to address the lack of open space required for the health of the community in particular for the community children to have a place to play and participate in healthy activities. The residents do not want more housing in an area currently the most dense in the County. Unfortunately the city supports and plans housing as the development. The residents will only support replacement of the demolished homes who’s lots they sat on now are planned for apartments and condos. The developer has been given free public land and affordable housing grant money as subsidies to increase housing density with it’s associated social negatives. The developer using the obove subsidies will additionaly profit by selling condo units, own and manage the rental units of this unnecessary housing development in this area. The argument here is service the residents vs. developer profits-interests. SACReD advocating and representing the area residents are communicating to the city that the city should be concerned with providing the area residents want they need for affecting the increase in their quality of life and not diminish it by supporting an increase in housing density. 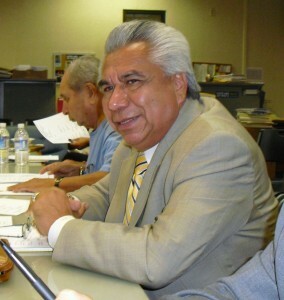 Alfredo Amezcua has a long history of civic and community involvement at various levels within the city of Santa Ana. His decades long involvement at all levels within civic and community issues were not governed by seeking political office. His leadership with SACReD is no different.